Greetings! I was initially puzzled by the appearance of Polypodium virginianum sori, suspecting some nasty fungal parasite feeding on the fern's sporangia. After I educated myself (I'm learning as I go - thanks to Google mostly...) about biology of Polypodium I found out that the bulbous red structures are specialized hairs called paraphyses. P. virginianum is an evergreen species, the hairs protect the spores from elements. The diameter of the cluster is just under 1mm; a single sporangium measures around 170 micrometers across. 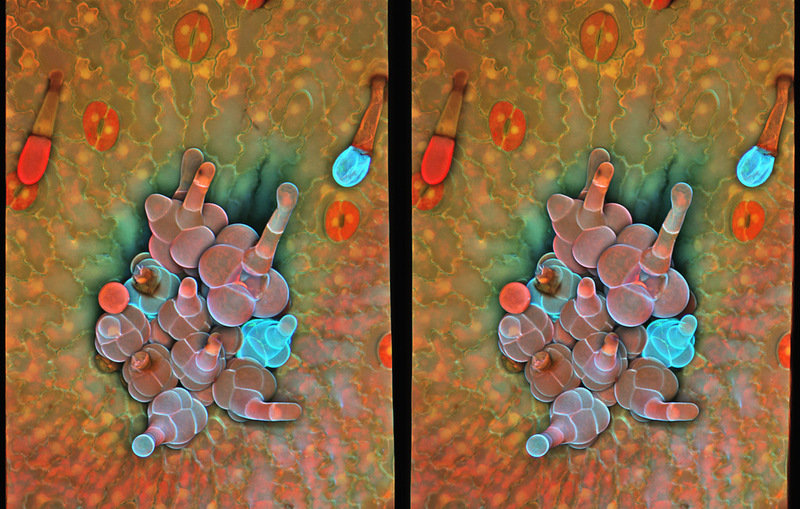 Colors reflect varied affinity of cell walls to Cogo Red and Calcofluor White dyes; auto fluorescence of spores and chlorophyll contributes to the mix. Imaged with Zeiss LSM 710 @ 100x. Top view of a small but mature sorus - “relaxed-eye” stereo-pair. 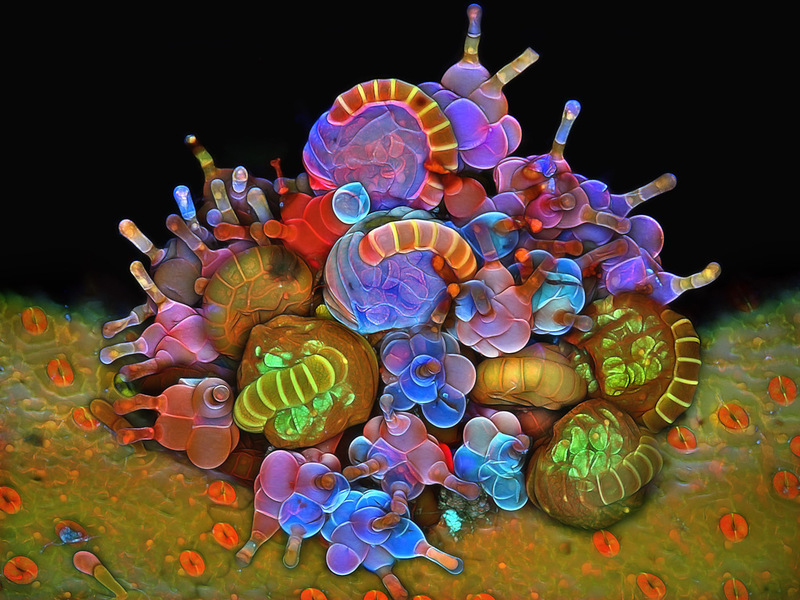 I am intrigued that the annulus "springs" around the sporangia come out in so many different colors, with the light bands ranging from red to yellow to green to brown in the first image. Do you have any idea what causes the difference? I don't have a good control - i.e. all samples were stained with CW and CR - so I can't tell in what part staining and auto fluorescence contribute to the color, but one thing is pretty certain - the sporangia were at different stages of maturation. The water and, more importantly, lignin content was therefore different; I suspect that the dyes I'm using bind cellulose with affinity dependent on packing of cellulose fibers, hence the variation in signal/color. Magnificent! I've never seen anything quite like this. Ok, now that I have picked my lower jaw off the floor, dusted it off and put it back in place...how did you prep this specimen? Did you do something to permeablize the fern surface or just soak the sample in buffer with Calcofluor and Congo Red and rely on whatever got into the surface? Also, what solvent for the dyes? 0.2M Tris-HCl at pH 8.5 or was this just PBS with some bicarb in it? I'd like to try something similar (alas, I don't have a CLSM in my basement, but I do have one at work that MAY just have to undergo an urgent bit of preventative maintenance soon...). Vos photos sont incroyable en tout cas superbe travail. Another set of stupendous images from Igor. Gadzooks and thanks! I'd love to see the first image as a cross-eyed stereo pair (hint). Reading about the Zeiss LSM 800, I get the impression that calling it a "confocal microscope" is like calling the F-16 a "jet airplane"—true, but not remotely conveying how sophisticated and powerful this instrument is. I’ve considered adding confocal capability to my rig, and these images tempt me to do so—but I think that nothing I could add would come remotely close to what the LSM 800 can do, with its easy capability to capture a wide variety of wavelengths in parallel. Of course, as with an F-16 fighter jet, the equipment is nothing but expensive junk without a skilled and talented pilot. Igor leaves no doubt that he is that. The following will be humbling, but perhaps useful for comparison. The same subject in visible light, more like the way a human eye might perceive it, is here: Sorus of rock cap fern (Polypodium virginianum). This image was made by a mere mortal, and in company with Igor’s images, will underwhelm. As someone who has photographed the same subject, my attention is immediately called to the fact that I shot at 4x, obtaining a similar field of view to what Igor obtained shooting at 100x. So Igor’s shots must have involved considerable stitching. Egad—does the Zeiss LSM 800 stitch that well? Igor, how much human effort goes into this—a lot, or does the instrument do most of the heavy lifting? Beyond the wow factor, Igor’s regime gives us interesting clues to the physiology of this fern sorus—clues different from those obtainable by visible light imaging. Rik remarked on the different colorings of the spring-like structure on each sporangium. Igor responded with insight correlating color to materials relevant to sporangial maturity. This seems correct to me. 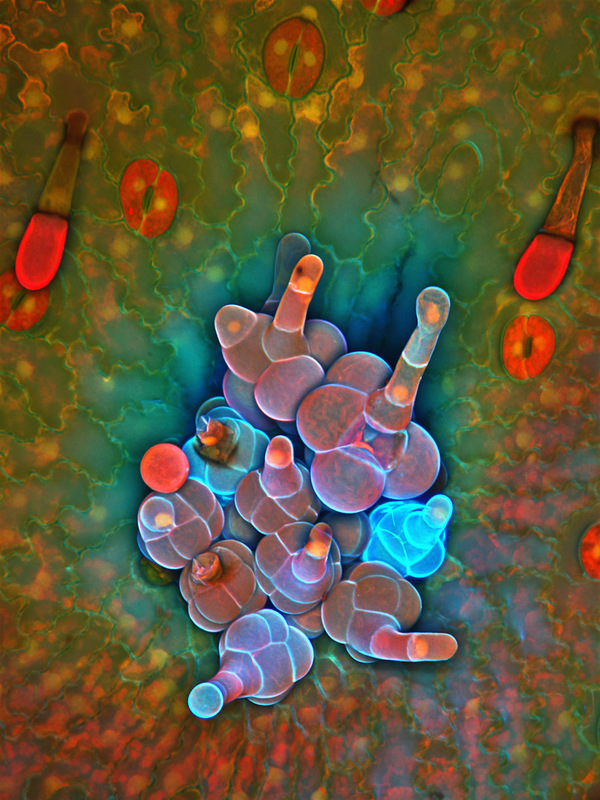 But in addition, note that not only the spring-like structures, but elements in the sporangia themselves, have different colorings. 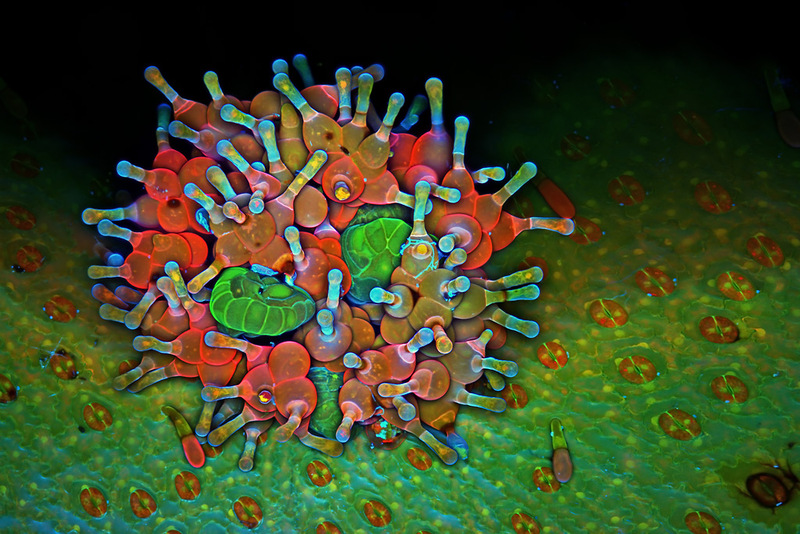 I’d love to see a temporal series of these images, as the spores mature. We would probably learn a few things about how the spores, sporangia, and related structures mature. I found out that the bulbous red structures are specialized hairs called paraphyses. P. virginianum is an evergreen species, the hairs protect the spores from elements. May I here raise a small quibble? Agreed, P. virginianum is evergreen. Also agreed that these specialized hairs do probably protect the spores from moisture. But I’d submit that these two facts are probably unrelated. 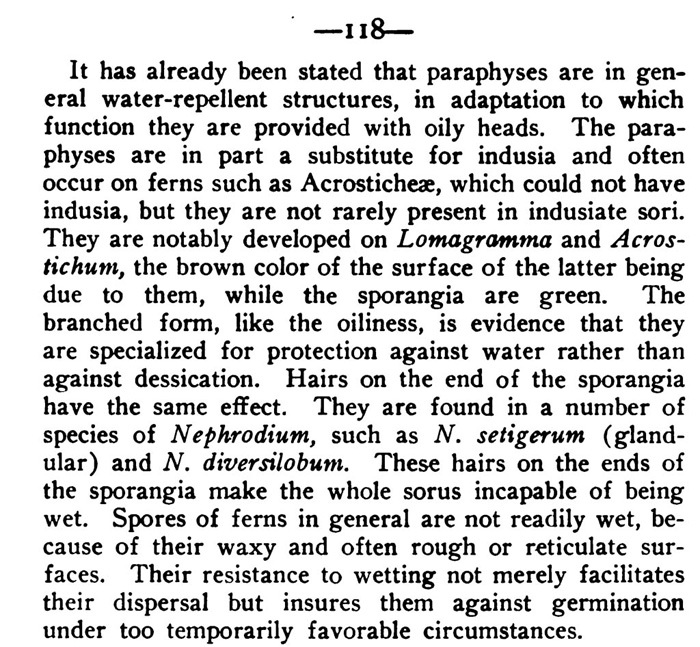 Let me explain my thinking: Paraphyses hairs are present in about one third of fern species—many of which, so far as I’m aware, are not evergreen (though I’ve not made a careful study of this). Further, my sense has been that P. virginianum drops its spores long before the cold of winter—so I’d expect the protective function of paraphyses to be independent of the evergreen status of the fern. (This said, I must admit that I’ve never checked P. virginianum for spores during the cold months, as every other fern I’ve checked drops its spores before first frost. My nearest patch of P. virginianum is about an hour away, and as soon I get a chance, I’ll go and examine them, as the cold months are upon us here). 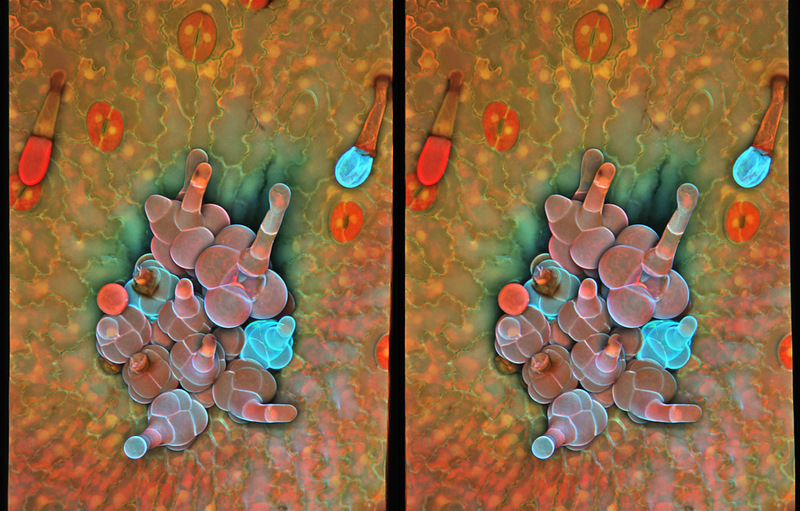 To me, it seems more likely that the paraphyses form a defensive outer layer of oily, hydrophobic surfaces that repel water while the fern's spores are maturing, allowing the fern to release them under ideal conditions, reducing the impact of short-term moisture fluctuations such as the nightly dew cycle. Not a protection for an evergreen fern during the long winter. My own guess is that Chris's "4X" and Igor's "100x" are completely different beasts. I think I know that when Chris says "4X", he means optical magnification onto sensor, excluding further magnification from sensor to final display medium. But I'm guessing that when Igor says "100x", he's quoting an instrument's specification that includes magnification to some final display medium. I will be interested to hear how badly I have guessed about this! I think I know that when Chris says "4X", he means optical magnification onto sensor, excluding further magnification from sensor to final display medium. You are spot on, Rik, regarding my meaning of this description. It will be interesting to see if this is also what Igor means. Woaa, incredible, like false color on MEB, I have to read all that to understand how you do that ! Stunning photo. I tried the same using standard autofluorescence a while ago and although the result impressed me back then, this is in a different class.